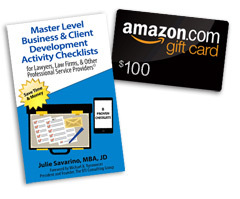 If you are employed in-house by a law, accounting, financial, or professional services firm, then you are eligible to enter our monthly drawing for a chance to win a copy of our new book Master-Level Business & Client Development Checklists for Lawyers, Law Firms & Other Professional Service Providers and a $100 Amazon Gift Card. Simply enter your Name and Business email below. Personal email addresses, such as name@gmail.com will not be eligible to win.